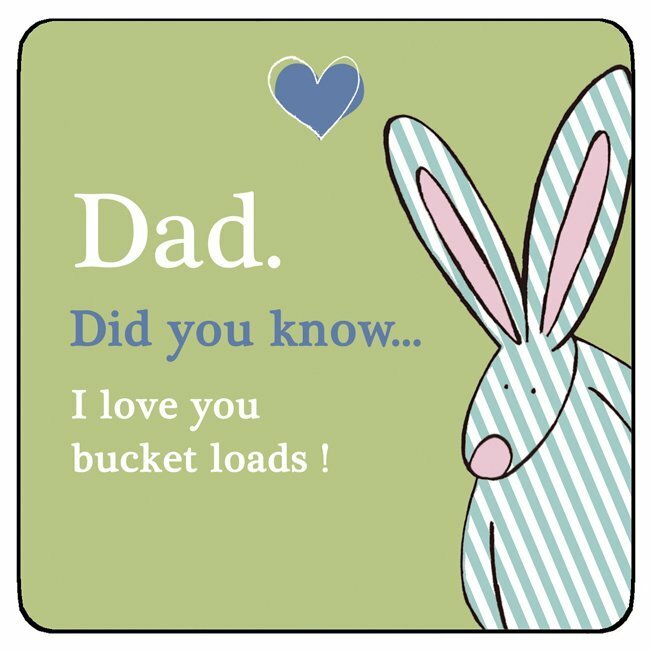 Coaster – Dad. An incredibly stylish way to protect any of your home surfaces from water rings, spillages and stains. Almost too wonderful to cover with a mug or glass,this coaster makes an ideal gift for a new home or just as a ‘pop in the post’ thought. This coaster is a practical and elegant addition to any household for everyday use. All Rufus Rabbit coasters have the highest quality matt lacquered surface meaning that they are scratch and scuff resistant and able to withstand temperatures of up to 100 degrees C. With a cork backing, this coaster is slip resistant and easy to keep clean (although we would definitely suggest that you don’t pop them in the dishwasher!) With a little TLC, these coasters have the potential to give you years of service. Why not consider some matching products featuring the same design to add to your collection or to make the perfect gift set? Please don’t put in your dishwasher!